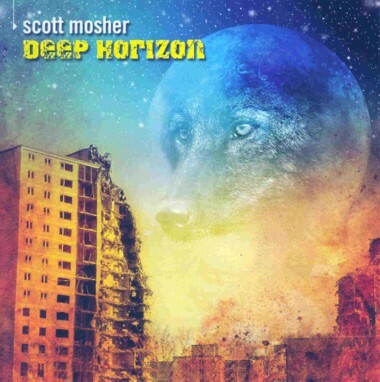 Review: "Mosher, Scott : Deep Horizon" - Sea of Tranquility - The Web Destination for Progressive Music! Scott Mosher has been around for a number of years now and with his latest release, has allocated the vocal duties to Scott Oliva whose voice has an immediate impact on the listener after little more than a few minutes of the opening chords. Scott's voice is incredibly powerful and coherent with the lyrics being extremely well pronounced. He does however have a penchant for using plenty of vibrato to deliver his message which becomes particularly noticeable on the third track, "A Path of Pride". Whether this affects your own enjoyment of the album may become an issue as there are only a few vocal songs without this little extra thrown in. Atmospheric keyboards and guitars abound throughout all songs although the drumming is of the canned variety and while more than adequately done, there can never be any escaping the fact that the ultimate sound can often be far too manufactured. Scott has opted for a slightly heavy approach for his latest album as he lays down some thick and tasty power chords and scorching lead breaks with a more spacious backdrop when the keyboards kick in. When reviewing any Scott Mosher album there can be no ignoring an additional quality that accompanies his music and that is in the graphics department. Being a graphic artist and designer (and very adept in this area as well), Scott has included a very impressive booklet filled with extremely clever graphical images that are reminiscent of the after effects of a nuclear blast melded with what might be his take on all things astral. Many of the images are stark and austere while possessing a very ethereal concept such as the middle spread with its depiction of the Aurora Borealis hovering over a raging lake of fire with a compass adorning the centre. Brilliant work!!! This is definitely an album that impresses more with each listen and while the initial overuse of the vibrato with some of the songs was somewhat off-putting, it becomes less of an issue as the subtleties of each song unfold. The crunch factor is just right, the songs are strong and forceful without going overboard and the guitar work sits perfectly with the atmospheric and astral themes. All in all, this is a pretty solid release and while not quite as ground breaking as some might like, it is nevertheless a worthwhile listen.